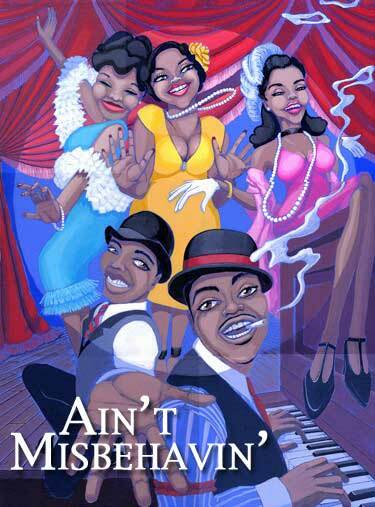 Fats Waller's Fabulous Broadway Musical Revue set in a 1920's Harlem Speakeasy. Frank Bartolucci (Producer/Director) would like to thank the Epiphany Theatre Company of St. John for rekindling his love of the theatre, his investors for believing in the dream, and the cast, crew, designers and band for their tireless dedication and talent. After a 20 year hiatus from professional theater, Mr. Bartolucci is pleased to announce A State of Grace Productions plans to continue bringing professional theatre to our islands and thanks you for your support. Josephine Thomas-Lewis (Musical Director) known as Jo Jo, was born on St. Thomas less than 40 years ago. She has been the Musical Director for the last 3 Starfest Productions and the 1998, 1999 and 2002 productions of Christmas Caribbean Style. Her expertise brought these productions to the Reichhold standard of excellence. She owns Jolajo productions, a company that provides sound tracks, vocal recordings and training, sound system insulation, and other theatrical and vocal services. She endeavors to continue promoting local talent through all possible avenues. Jude Woodcock (Choreographer) graduated from Southwest Missouri State with a BS in dance, theater and art. Upon graduation, she joined the internationally renowned Pilobolus Dance Theater as a dancer, choreographer, and rehearsal director. When Jude retired from the road she moved to the Virgin Islands to be with her husband. Jude currently teaches at the St. John School for the Arts and the American Dance Festival in Durham, North Carolina. Ms. Woodcock is thrilled to have the opportunity to work with such a talented cast. Nayda Young (Costumer), fashion designer, seamstress, sewing teacher and retailer, has been featured on the cover of Radiance Magazine, pictured in the TV Guide, Big Beautiful Woman, and the San Francisco Chronicle. Young has made television appearances on talk shows such as San Francisco's "People are Talking". Presently Young owns a boutique on Coki Beach featuring some of her designs and that of other manufacturers and designers. To reach Nayda call 775-9291. Pamela T. Sullivan (Set Design) has been on St. Thomas for three years. A native of South Carolina, she has been involved in theater since 1983, either as set designer, actor, or director. She is a graduate of Ringling School of Art in Sarasota, Florida, and the Instituto de Allende, San Miguelde Allende, Mexico. For the last three seasons, she has been Set Designer for the Pistarkle Theater on St. Thomas. Pamela also has her own business, Brushed Strokes, which does faux finishes, murals, fine art restoration and painted furniture. Grant Simmon (Lighting Designer) is very excited to be involved in this production. He received his BFA from Northern Illinois University in 2000 and has been working in theater since then. Grant just recently finished a production of "The Fantasticks" with the Epiphany Theater Company on St. John. Other design credits include numerous live music shows and corporate events in the Chicago area. He would like to thank his wife Nicole for her loving support.